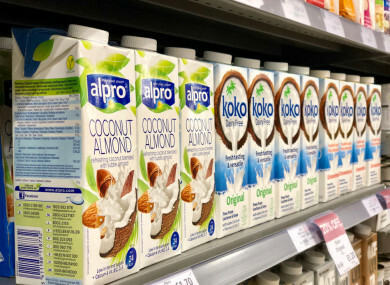 Sales of plant-based milks were 40% higher than in January 2018. FOLLOWING A RECORD spend on groceries in December, Irish shoppers started off the new year with good intentions as new figures show a rise in the sale of fruit, vegetables and plant-based milk in the last month. The latest Kantar Worldpanel data shows how new year resolutions may have shaped shopping baskets with the sales of fruit and vegetables up €7 million on last year. Consumer insight director at Kantar Worldpanel, Douglas Faughnan, said that following last month’s record spend of €995 million on groceries, the average household spent €120 less during the four weeks to 27 January. Despite a 3% drop in supermarket sales in January, Faughan says new years resolutions and the popularity of ‘Veganuary’ account for the rise in sales of healthier products. “Vegetable side dishes and vegetarian sausages and burgers collectively rose by 35% and, amid the rising popularity of Veganuary, sales of plant-based milks were 40% higher than in January 2018,” he said. According to the data released today, the popularity of ‘Dry January’ appears to be waning, with more than a third of Irish households buying either beer, cider or wine in January. “Dry January may have dominated headlines and social media feeds but not everyone abstained,” Faughan said. Wine proved to be the most popular – 25% of shoppers took home at least one bottle during the past four weeks. Dunnes was Ireland’s leading retailer over the 12-week period, accounting for 23.1% of the grocery market. It was the only other retailer to gain market share this period, attracting enough new shoppers to boost its sales by 4%. Tesco followed in second place at 22.1%, while SuperValu came in at third place at 21.6%. Aldi and Lidl continue to gain market share and more than 70% of Irish households shopped at both during the past 12 weeks. “Aldi and Lidl have demonstrated their popularity at two distinctly different times of year – December and January – by providing shoppers with opportunities to both indulge and save. Both retailers achieved record market share over Christmas and that strong performance has continued into the new year – Aldi increased sales by 10% and Lidl by 5.2%,” Faughnan said. Email “'Veganuary' influenced what we put in our shopping baskets last month”. Feedback on “'Veganuary' influenced what we put in our shopping baskets last month”.